We havent been out on the grass for ages, but Mummy has occasionally brought some in for us. Its usually been a bit on the damp side, so I suppose she knows it’s not right for us to go outside and eat it. 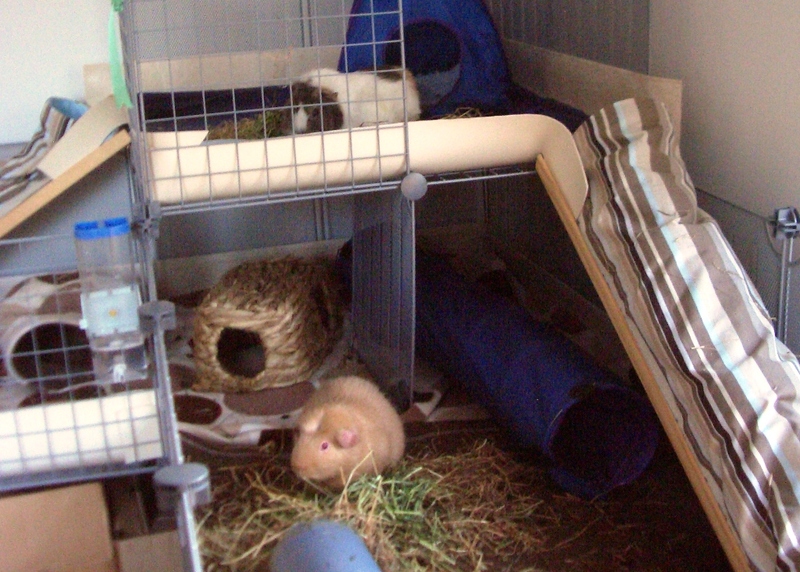 But I think today is the official start of winter, since she gave us the dried grass – Readigrass – as a treat. It’s yummy. Very nice indeed. It’s not as nice as good fresh grass, but it’s probably better than bad fresh grass. Mummy gave each our own pile. Victor is in the loft and I’m down below. Of course, Victor had to come down and test mine then have a drink. But Mummy says its good for him to get the exercise walking up and down tunnel to the loft. Ooh.. that looks nice! You look like nice piggies – we used to have some piggie friends, but they vanished after some cruel people either stole them or let them out of their cage..